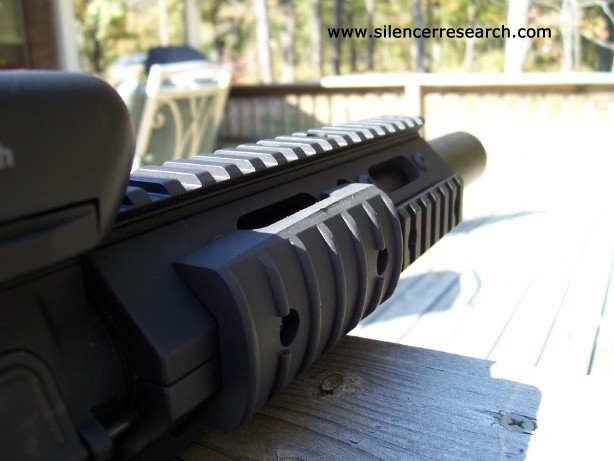 This initial review was done in late October 2005 for a post on AR15.com. It is represented here in the same light that I posted it on AR15.com. Another, far more thorough review will be done on Colt 635 style uppers in the future, including dB ratings, ballistics, etc. The tests will included the Gemtech Talon w/Trinity, the Colt 635 SMG with at least two 9mm muzzle cans, and the Norrell DEA 9mm integral upper. 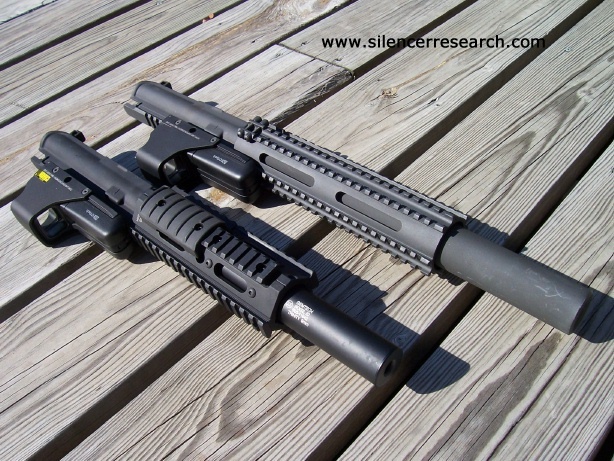 The test may expand if I can get more Colt 635 style uppers to test. 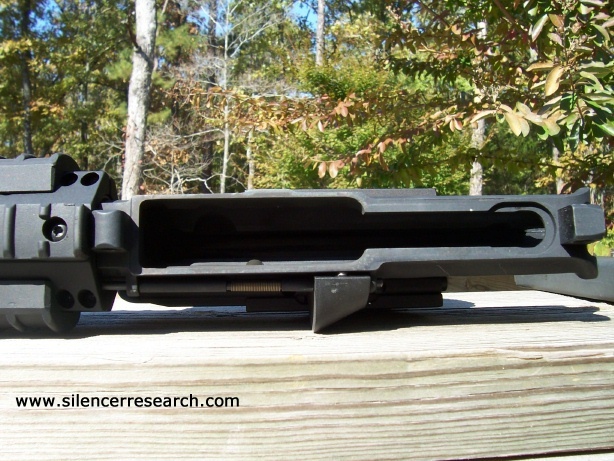 Here is the AR15 post on the LRM 169 vs the Gemtech Talon/Trinity. Lee Minor, the founder and owner of LRM Custom Firearms and Suppressors is going to turn the reins over to another manufacturer that will operate Lee's business. Lee will remain as a consultant only. I bought the LRM 169 upper a while back and first want to say that Lee Minor of LRM (the owner) is a fantastic person to work with over the phone and has offered me stellar service. 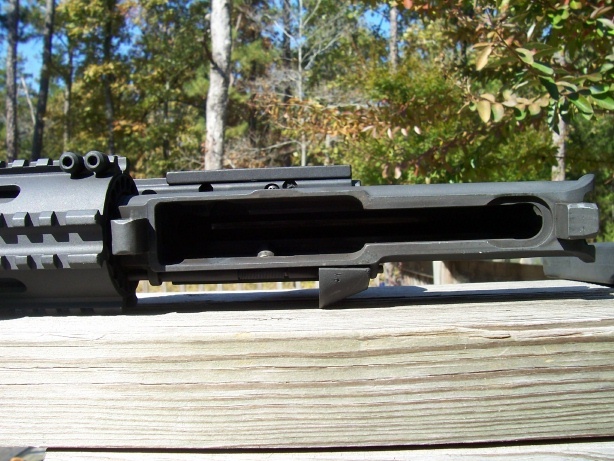 The LRM upper is a 9mm upper for the M16 (I say for the M16, because if you don't put it on a full auto, then you must register a SBR; LRM does make a 16inch barrel version to avoid this). 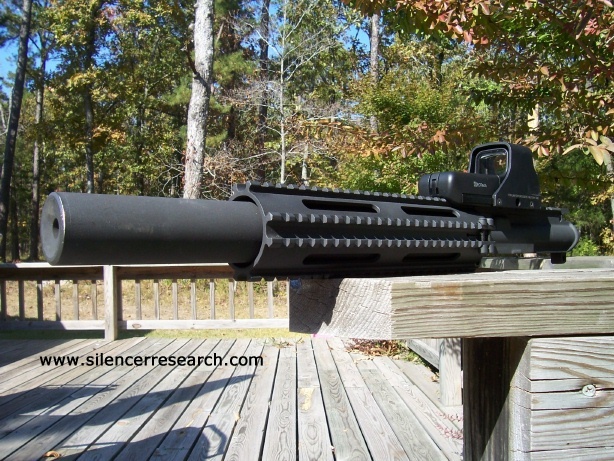 Its barrel length is 12.75 inches long as per the Form 4, however I am pretty sure that this includes both the barrel and the baffle stack. The LRM upper retails for $1,175 and comes with the integrally suppressed upper, bolt, charging handle, buffer, mag block and one magazine (a modified Uzi magazine). Its finished in John Norrell's Moly Resin finish (mine is done to match my lower half and is not typical of the way the upper ships from LRM). 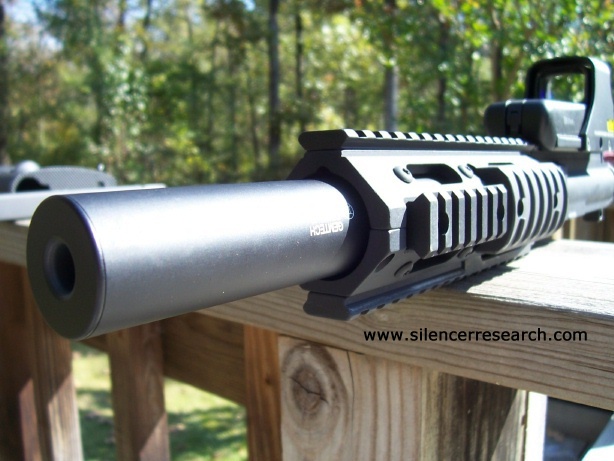 The silencer cannot be moved to any other firearm with ease. The handguard is the Olympic Arms FRISH handguard. 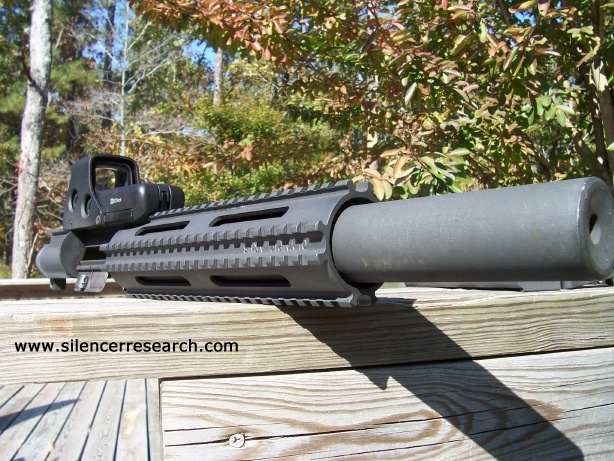 The LRM has a ported barrel. This allows the shooter to utilize cheap 115 grain 9mm ammo. 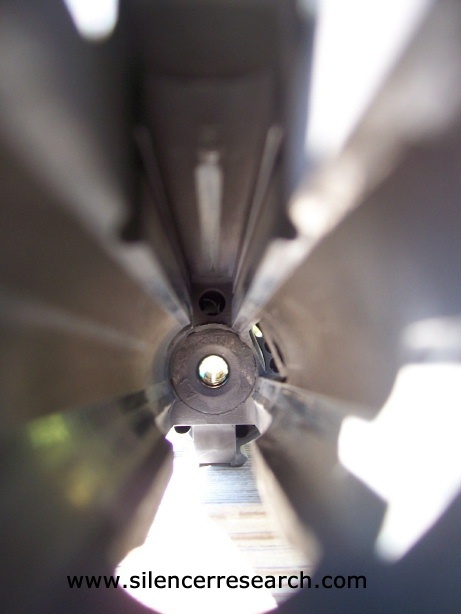 The ports, simply holes drilled into the barrel to bleed off gas, slow the bullet down below the sound barrier. This works with MOST commercial ammo, as per the manual you can get a few shots that will be trans-sonic or supersonic with hot loaded ammo or very cold temperatures , just change brands. S&B is pretty hot. The speed of sound is supposed to be around 1130 feet per second at 60 degrees f at sea level. Every degree colder the FPS number drops. 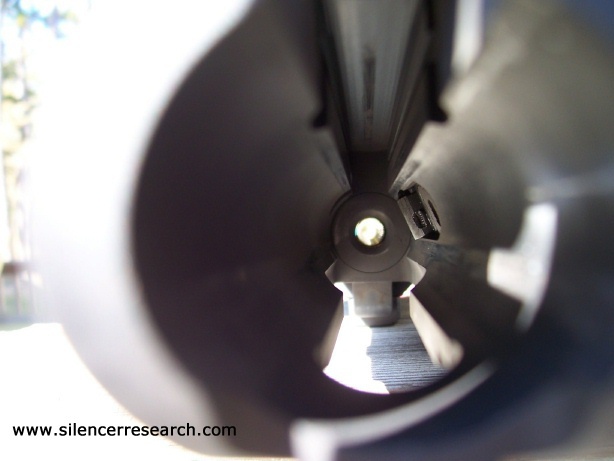 Shooting 115gr ammo in the Talon/Trinity system defeats the purpose of a silencer as the supersonic crack is loud. I only did this for comparison. As you can see the shooting subsonic ammo in the LRM (while quieter than shooting 115 grain stuff) takes too much off of the ammo for it to do its job. However, when you shoot the 115 grain stuff in the LRM it delivers about the same ft lbs as the subsonic ammo out of the Talon/Trinity. 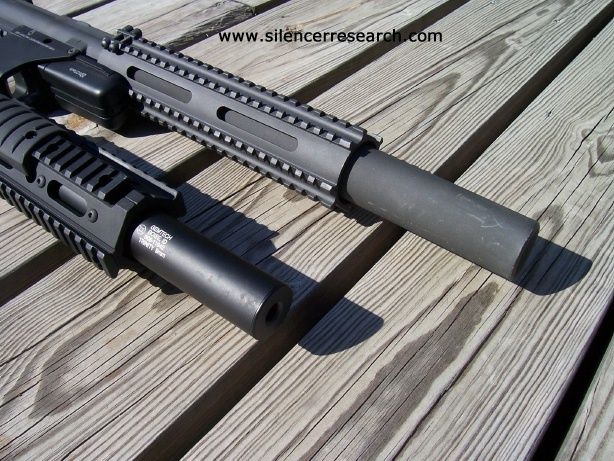 Which one is louder/quieter? 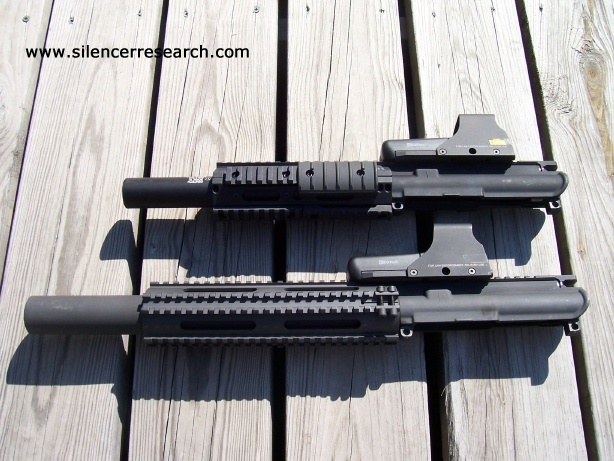 The quietest possible configuration between the two is the LRM shooting Special K. The LRM has a first round pop, but its not as loud as the Trinity’s first round pop. The Trinity is 1.25 inches outside diameter by 6.5 inches long. The LRM is 1.5 inches outside diameter by 12.75 inches long so this can account for the difference in first round pop. The LRM can eat more gas than the smaller, lighter Trinity can. Now I have included videos for everyone to see and to make their own minds up about what is louder/quieter/better. At the end of the LRM videos, I shoot full auto with a slow fire buffer and I shoot the Talon with the faster fire buffer. The videos are QuickTime. They are rather large and are around 30 seconds each. I had the camera about 20 yards to the left and forward of me shooting so as to help get a better picture of what the silencers sound like. This is not perfect and does not represent EXACTLY what they sound like. This is merely a casual test done in my backyard on a Sunday afternoon. The wind was blowing a bit too. However, I think that this is a reasonable group of videos to show some differences. The best way to compare videos is to save them to your hard drive, open two at a time side by side and alternate using the slider control and go by that. I have no video editing software so I am sorry about that. If you don't compare them side by side, you won't hear a huge difference, but its there. 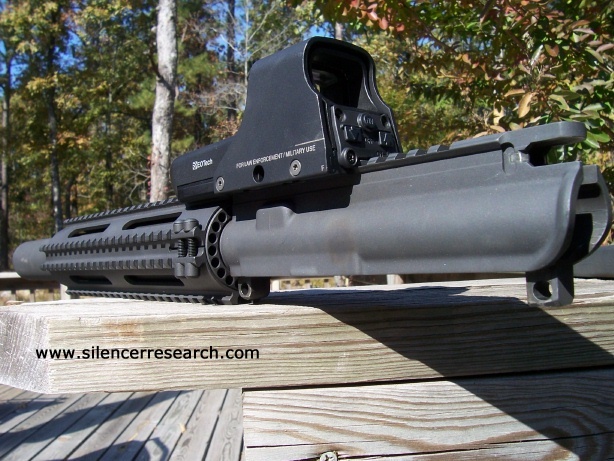 LRM upper shooting 147 grain "Special K"
Talon/Trinity upper shooting 147 grain "Special K"